The David of Air Naturalizing Takes on the Goliath of Stank. CritterZone Review & Giveaway. I learned about CritterZone, the air naturalizer about a year ago. I’d heard good things about it and wanted to give it a try. Frankly, I was sure it wouldn’t work. It’s TINY! Who can believe a little doohickey like that could clean the smell out of a small space, let alone a room? With much trepidation I took on the task of testing out two units because baby, I have a lot of foul odor issues in my house and one wouldn’t cover it. 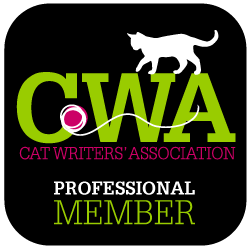 Running my cat rescue, Kitten Associates, and using my home as the main foster location can be a lot of fun. I get to play with the kittens, watch them grow, enjoy their warm purring bodies fall asleep in my lap, but the one thing a lot of folks don’t know is very young kittens, often with parasite-laden bellies, produce a special sort of foul-smelling stool that the U.S. Government should use as a toxic agent in chemical warfare. Yes. It smells THAT BAD and on top of it, the smell isn’t from ONE kitten, it’s usually from FOUR OR MORE. Combine that smell with what their moms unload, (who have eaten God knows what before they come to us and got good food) and it's a nose-hair-melting blast. ©2012 Robin A.F. Olson. Does this happen in your house? If ONLY I had a CritterZone running when I shot this video! Although I scoop the litter pan MANY times a day and refresh the litter often, it does no good. In the winter, I can’t open the windows and the door to the foster room is kept closed, so smells are pretty much sealed in. I can’t use a candle or plug-in cover up because a) they don’t work and b) I don’t want chemicals in a room with 4-week old kittens who would inhale the fumes. It’s too dangerous. The added problem is that we have people coming over all the time to meet the kittens and they can’t be grossed out by the smell or we’d lose out on adoptions. I was growing tired of making excuses to adopters about forgiving me for the smelly room, but I was not sure what I could do about it. ©2014 Robin A.F. Olson. Buttercup checks out the CritterZone. Enter CritterZone. I plugged it in, set it on high, and left the foster room for an hour. I returned to the room and the smell was GONE. I thought I lost my mind or that my sense of smell had been destroyed by smelling one too many cat “bombs.” I asked our visitors (they had kids who have an even more sensitive sense of smell) about the odor in the room and they could not detect anything other than a fresh scent. This is in addition to the fact that I knew one of the kittens had recently used the pan for “evil”. I could have stopped my test there, but this is not a mamby-pamby review. I told you I have stink-issues, so the test continued. ©2014 Robin A.F. Olson. Our foster kittens can be friends with the CritterZone because it doesn't use harmful chemicals. I have 9 cats who occasionally urinate beyond the confines of their litter pan in places that break my heart. I’ve had little resource in how to get rid of the smell even though I’ve used a lake full of odor “removers.” Some do an okay job, but when Pee-Tunia peed on the sofa, that was it. It was a first and I wanted it to be a last, but the only way to stop the others from peeing in the same place was to get the smell OUT. ©2014 Robin A.F. Olson. Can you see the crystals? 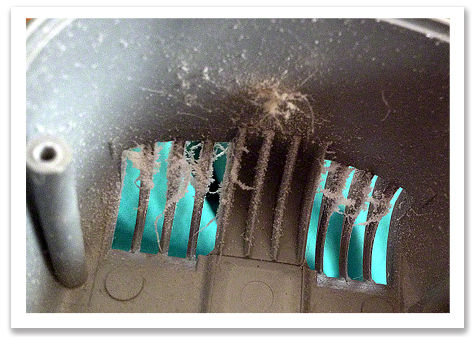 This shows the unit really did the job, but it also means it needs to be cleaned. (photobomb by Fluff Daddy). I read that I could place the Critterzone face down directly onto the soiled area. It wouldn’t clean the stain, but it would remove the smell. In my case, it would take a long time because there was a large area involved. I’d have to place the unit at one end of the stain, then move it every 45 minutes along the length of the stain. If the area dried, I had to re-wet it with water. I did spray the area and the fabric was stained (my fault), but the smell started to go away. I could even hear the unit sizzle when it was first placed on the soiled area. It took a good day, but by the end of it, I carefully sniffed the cushion and the smell was gone. The unit, however, had grown small white salt-like crystals on it which meant it had done its job and it needed to be cleaned. I found easy directions on how to do that on the CritterZone web site. ©2014 Robin A.F. Olson. I'm sure the folks at CritterZone are not happy to see this. You're SUPPOSED to clean the unit every two weeks. Oops. I didn't. My bad..but heck, it's STILL WORKING (and now clean). The good news is that it only takes a few minutes to clean the unit. I do NOT have to buy filters, which always ends up being a pain in the neck. There are NO mystery chemicals to add to get it to do its magic. 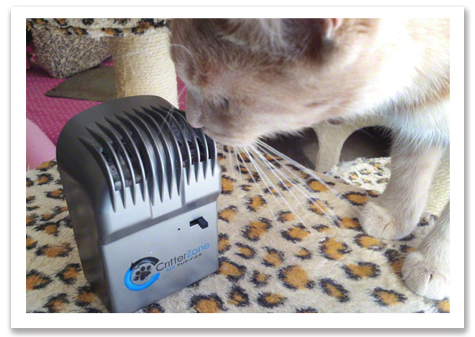 CritterZone provides indoor air with the natural charge it needs to virtually eliminate odors, allergens, dust and bacteria in an area up to 800 sq ft.
©2014 Robin A.F. Olson. Time for a clean up! The cover comes off easily for cleaning. There have been a lot of reviews of CritterZone and many tests, but I doubt anyone has put the CritterZone into their car and hauled 15, 30-gallon bags of garbage including lots of bags of soiled cat litter across town to the local dump. This winter was so bad, we didn’t have garbage pick up for MONTH, so we had to move our own garbage by car. This was definitely something I did not EVER want to do...be trapped in a car with the stench of rotting food and cat excrement even for a few minutes. It was too cold here in Connecticut to open the car windows during our trip, but I figured that’s what we’d have to do. I feared this sort of smell was going to “stick” in my nose for hours after exposure, too. I hooked up the CritterZone and placed it between my partner Sam and I as he drove us to the dump. As the heat kicked in and the car warmed, I expected to get knocked over by the smell of the garbage. I heard the unit buzzing away, cleaning the air. I expected to smell something terrible, but in fact there was no bad smell. 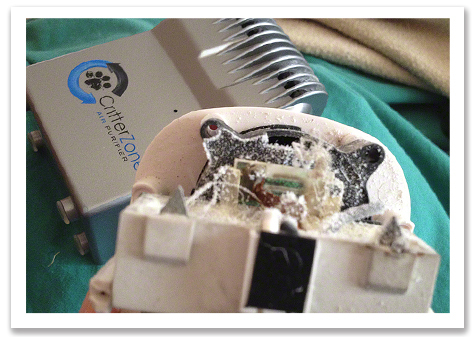 That's when I knew without a doubt, CritterZone is your first line of defense in preventing stench-offense. The only caveat I will add is that I had mild respiratory irritation, which I discovered when I left the unit on overnight in the foster room. It had cleaned the air, but since I left it running after it had done its job was when it caused the issue. I wanted to sleep with the kittens, but not have the smell of a litter box visit wake me up. Turning off the unit stopped the irritation. Because it works so well I only run it from time to time. You may have a completely different experience with how long or under what circumstances you should turn off the unit. I did a test, leaving a unit running 24/7 in a room that was open to the rest of the house and it worked really well and I had no issues. 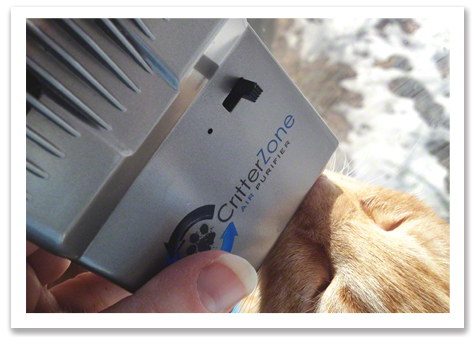 CritterZone can also help folks with ALLERGIES, too! 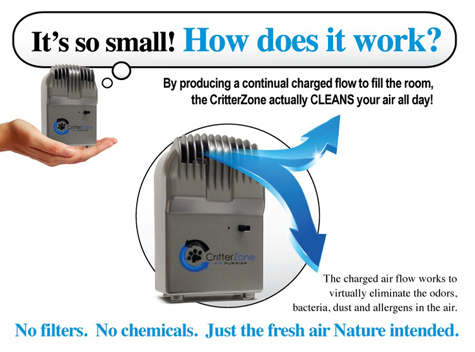 I just fret about stinky air, but if you have the sniffles you might want to try a CritterZone for that as well. Here’s more information about their technology and the MANY WAYS it can help make your life better. 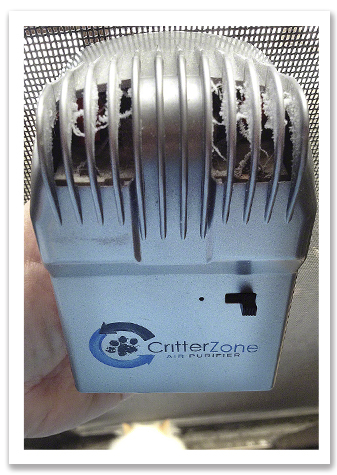 CritterZones come as a wall mounted unit for near the litter pan or other locations that need naturalization or a corded unit with an optional adapter (you can purchase separately or it comes with their Travel Pack) for your car for added flexibility. 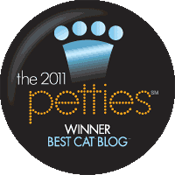 If you'd like to WIN a CritterZone, simply leave a comment in this post to enter. Tell us about your worst stench and why you need help. Make it funny, creative, compelling-whatever you think you need to say to convince me that you should WIN! Best entry as Judged by me, Robin Olson of Covered in Cat Hair, will win ONE CritterZone. You may only leave ONE comment for ONE CHANCE to win per person. This Giveaway ends Friday, MARCH 14, 2014 at 11:11 PM EST and is open to residents of the USA, only (sorry guys!). Rules, quantities and whatever else I forgot are subject to change without notice. After careful consideration, from time to time I write product reviews. If you see it here, it's because, at LEAST I think it's worth you knowing about even if I have an issue with it and, at BEST, I think it's amazing and we should all have one, two or more of whatever it is I'm reviewing. I get NO reimbursement for writing these reviews, though to write a review I am supplied with the item, as I was in this case. This review is MY OPINION, ONLY. The result you experience using this product may differ. Kitties are like potato chips - ya just can't have one!! I've got a laundry room/kittie runway with this thing's name on it! Thanks so much for taking the time to check it out, Robin! Great product!! With a whopping 16 cats and 7 boxes, I need every bit of help I can get! I work hard to keep the houee clean and not smelling like there are 16 cats here, so every bit helps! Why have I never heard of this before!? 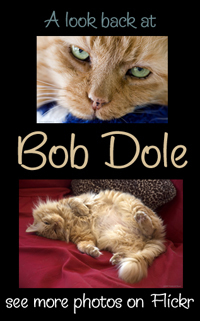 This sounds like a *fantastic* item for any mulit-cat home (of which I have certainly become, lol!) 3 pans/one bathroom can be an experience! 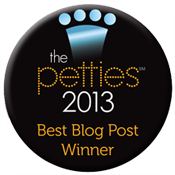 I'd be thrilled for the chance to win one -thanks for a VERY interesting article on the CritterZone! I also have a multi-cat household. I have rescued kittens/cats and half of my herd used to be feral. One group came in with the Giardia parasite. There's one feces smell that will make up stand up and take notice. I have 5 cats. Two of which have litterbox issues. I constantly scoop and even bleach the boxes and change out the litter every 3 days trying to combat the smells and also to keep the 2 fussy ones in line and using the boxes. However, this doesn't seem to completely placate them. One is 14 and if she finds a satisfactory spot, she will just "let it go". I have seen her literally shoot it against the wall like a male-and yes she is spayed. :-S the other one is younger and has had litterbox issues since being a kitten. I have tried moving the boxes, changing boxes, trying different kinds of boxes, and nothing has worked! She does have issues with some of the other cats, and I've used some of Jackson Galaxy's recommendations which has helped but not completely solve the issues. On top of all of this, I also will foster kitties from time to time, and that adds to the odor issues of the home. I'm not a big fan of having company over because of all this, too. I have tried everything to remove the odors from the carpet including products recommended by Mr Galaxy and products recommended by vets but nothing works. 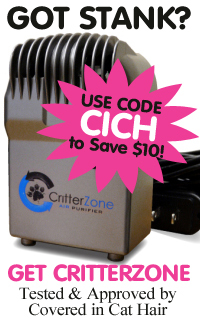 I would love love love to have a critter zone to try (especially if it'll neutralize the cat urine spots), but the price of the unit makes it a challenge to get one. Thank you for any consideration you give me. With 5 cats in a 2-bedroom condo, I am constantly worried about what visitors smell when they step through our door. It would be so awesome to be able to have visitors and not even have to think about whether they think I have a "cat problem." Please help a single girl out! OH. MY. GOODNESS. I live in a desert with 9 indoor cats. So, while some people cannot open the windows for a couple of months in the winter, I spend about nine months of the year with the house sealed up against the heat. If this product would work for me, it would be such a blessing. --I'd leave a longer comment, but I have a client coming to my home office in 40 minutes, and I have to run around and make sure I haven't missed any "accidents" for them to smell when they walk through my front door. I also foster kittens and my friends and have noticed the foul smell of their "contributions". (fortunately my husband can't smell) I just thought it was my fault for having so many kittens to a small room. I would either clean the litter box or remove it before people came to look at the kitties. This would be a great solution for me. I'm in admiration that you drove the garbage to the dump with all that waste in it. We have curbside pickup year round and it's still quite the chore for us. Scoopable litter keeps the garbage down but we can't use it with kittens, of course. I foster kittens and I have this problem all the time! I had no idea it was because of the parasites. I usually just clean or remove the litter box when people come to look at the kitties and hope that none of them decide to poo during the visit. I might also want to give it to our main shelter, Kitty Connection, which has a lot more cats and more of a smell problem. I'm not sure I can beat your story and that video was almost too real! My worst smell come from the same place as yours - a rescue kitty who had been on the streets and eating who knows what. We kept the kitty in a very small bathroom until we could could get him vetted and then for a few more weeks while we got him healthy enough to start meeting our other kitties They only way to visit with him was to go in the bathroom with him. Sometimes it was almost unbearable. (Your video brought back baaaaaad memories!). I'd really like to win the CritterZone. I have 3 cats, one who has asthma. He endures twice daily inhaled meds to try to keep it under control. We have to keep the house extra clean and avoid pretty much everything that is scented - which is everything these days! I'm thinking that the CritterZone would help with the usual smells of the litterbox but also help with scents I am not always able to control (like cleaning products) and perfumes guests wear to our house. We only have ONE bathroom. It does NOT have an exhaust fan. It is located on one side of a VERY small kitchen. No amount of air freshener, of any kind, can compete. I've had to open the bathroom window in temperatures below freezing! And yet, as soon as that door opens....WHAM! It hits you and it hangs around. I've got to try this! We've got 9 rescue kitties, at least one of whom is an "inappropriate eliminator", and we've all been closed up from the outside world during our first Minnesota winter. Critterzone sounds like it would make the "kitty corners" of the house smell much better! Gonna save up for a couple of Critter Zones! I, as usual, was the lucky one. A couple who had 9 cats hit misfortune and had to re-home them. After finding homes for 8 I got the last one. He's a very sweet 9 year old, obviously used to living with other cats, but he objected to his new surroundings by spraying. Everywhere. He even got on top of the entertainment center and systematically sprayed the whole wall. I've had to replace my (cheap) toaster and my very nice, perfect color red, fairly expensive toaster oven. And naturally I've caught my other guys imitating him. Yech. So tons of vinegar later it still smells. I'll have to paint 3 rooms and, short of putting him in diapers, this product could be my only hope. Did I mention I've been unemployed for 8 months? Otherwise I'd buy a couple of these. Why do we need help? Let me count the ways. Billy, Jessy, Prissy, Lucy, Bailey, Micky, Gabby, Zoey, Chelsey, Midnight, Hope and Spike. Had to re-count, yup that's all of them. We start our mornings on a game of hide and seek to see where the pee was deposited the night before. That can range from a floor spot, a heat vent, shower/tub drain, kitchen sink, stovetop, cat food trays that may only be partially empty, the side of the microwave, a dish accidently left out, a coat that didn't get put away, a door frame...I think you get the idea. 6 of our pee-ables are Bengal and Bengal mixes. Everyone is spayed and neutered but we must maintain our territories. 17 litters boxes with different types of litter for our picky pusses and a couple empty ones for the more discerning felines that won't use litter. All rescued Bratlings. That covers that bodily function now throw in a couple of kits that can make grown men weep with their odoriferous bouts with intestinal air. When you hear a tummy start to gurgle its every man for himself. Now don't get me wrong it's not only the cats, we have 2 large breed dogs and one giant breed dog also known as the Moose. This 150 pound moose can break wind that is beyond deadly and not silent. 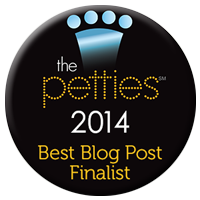 Thank you for considering us and if we don't win please pray for us. I live in Arizona. My cat room is at the far end of my house. The room is not air conditioned, so in summer I have a bigger odor problem than in the winter. I would love to try it! I have a cat with IBD, when we first rescued him he had no control over his bowels and his, um, eliminations were like brown lumpy water and the stink, the smell peeled paint and caused many an evacuation of the house. Seriously, he once got that "look" while I was holding him and didn't make it to the box, I had to wash 3 times and soak in baking soda to rid my body of that smell. He's since gotten solid and in control, but, the smell is still enough to burn your lungs. In addition to him, I have a female with food sensitivity and the only thing that doesn't make her sick makes her smell like a rotting corpse sprayed by a skunk, then there's the 17 year old who has to pee (and poop) on puppy pads because any litter box even looked at by another cat is "contaminated" and can't be used by her. PLEASE, I'm begging you, give me some relief. Wisconsin is not a good state for open windows, it's either cold or hot...I need some fresh air! My son refuses to visit me because he says my house "stinks" like cat pee. I do have multiple cats and cat boxes. I'm very conscious of keeping them clean and fresh because...well, I'm picky and so are my cats about clean boxes. I've used every product out there to keep the cat boxes and floors smelling nice but apparently it's not working. I love my cats and absolutely refuse to get rid of any of my cats to the irk of my son. I haven't been visited by my son in many months even though he lives really close to me. I admit I'm a crazy old cat lady, and proud of it. My son is very stubborn . I don't want to have to pick between my son or my cats because to tell you the truth my cats would probably win ( don't tell my son that! ). I would love to have the opportunity see if the CritterZone works. This could just be the thing reconcile my realationship with my son and restore my sanity. We have 7 cats, all rescues. People just dump cats out in our neighborhood. :-( our last cat came to us pregnant and we didn't know till last week when she delivered 3 new cute little babies. Surprised we were, she is partly ferrel. Hid her pregnancy quite well. This happened the day we took in an awesome, handsome dog from an owner who could no longer keep him. Now we have a full house! 10 cats and a dog. 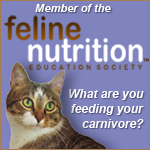 One of our cats is a Chantilly and has digestive issues. She can drop a bomb that stinks up the whole house! She also farts a lot, lol.. I could really use one of these units as I also suffer from terrible allergies. Thank you so much for considering us! Thank for all you do. Forget my four cats smell! I need it for me! I have a very very bad smell when my Colitis acts up. Even the paramedics don't want to come in the house! Lol! Combine my stinky smell and the cats, I could REALLY use it! But being on disability, I can't afford it! We have three fur-kids. Two are sisters and the other is their cousin. All were from behind the apartment where we lived in the inner city. The sisters will be four this year. Dahmi and Cuatro. The cousin is Mr. Bill Brasky, he will be three in July. They were so used to our old place. It was three floors and their three litter boxes were in the basement. You would have never known we had cats in that place. But we downsized considerably and now live in a very small upstairs apartment. I keep two litter boxes now and they are in the one bathroom. Four steps in one direction and there is the living room. Four steps in the other direction and there are two tiny bedrooms. Six steps and you are standing in what the rental agent laughably called the diningroom, eight and you are in the tiny kitchen! Soooo yeah when someone lets it rip you know it no matter where you are in this flat! I scoop every time I go to the bathroom if neccessary, and take the waste out in various types of bags. Used produce bags, grocery bags, even the plastic from the toilet paper! If I am sitting on the couch and I get a whiff of a healthy doodie I gotta jump up and dispatch it asap! You cannot enjoy "Downton Abbey" or "The Big Bang Theory" with your nose fulla funk! It just makes it hard to pay attention to anything else! And just try wrapping your brain around a rousing game of "Jeopardy" when yer gagging from one of Mr. Brasky's terrible turd torpedoes! Then there is attempting to be lulled into dreamland by listening to "ocean sounds" on the cell phone speaker when my girl Cuatro has totally missed the box. She doesn't seem to point it towards the litter and it runs down this plastic "Vote for Bob Wilson For City Council" sign that I cut up and put on the wall for just such occaisions! She has some potent wee! Despite the fact that all she does is drink water! I know this because I can hear her putting her paw in the bowl before she drinks. Lastly we have Dahmi who it seems has not gotten the concept of cat litter. She drops a dainty steaming pile and then paws the edges of the box for what sounds like eternity but never does she EVER paw actual cat litter over her dung! It just stares whomever is in the bathroom in the face with impunity! Daring you to be offended! I appreciate your consideration to be the weiner of this fabulous sounding innovation! These are somewhat like those air purifiers--ionic breeze. I am game to try anything. I am trying to sell my house and I hate using those awful sprays. Three Cats - one pees outside the box, so I've resorted to puppy pads everywhere; one doesn't cover her "business", so when I come home from work I KNOW who has gone potty; the third one just has to put up with the other two! I'd love the CritterZone! 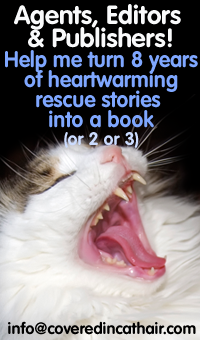 Robin, I would LOVE to have a Critter Zone because like so many of your other readers, I have permanent cats and foster cats (currently 12 total cats and 8 or 9 litter boxes). My biggest stink issue comes from cute little Lady B. She’s a one-eyed, five-pound bundle of fluffy black energy, a young adult I adopted about a year ago from a rescue-turned-hoarding situation. She has some kind of tummy issues (still trying to get a diagnosis) that give her frequent diarrhea and – probably because she grew up in a house where many cats used the floor as a bathroom – she doesn’t poop in the litter boxes at my house (though fortunately she does pee in them). My bathroom and basement floors get really gross really fast, and the smell seems to permeate the entire house. Thank you for considering me! I volunteer with LAPCATS rescue (1500+ shelter cats placed!) and foster cats and an occassional dog, plus have my own zoo :-). I've heard lots of good things about CritterZone and having one would surely make fostering more pleasant--especially for my visitors! Thanks for the opportunity to win one! I may not have as many cats as some, but I think that I have a champion cat in the litter box challenge. Her deposit will bring tears to your eyes. Her two sisters avoid that box. We would all love to have the cleaning effect of CritterZone., and a clean smell to greet us in "the room". I am definitely in desperate need of one of these miracle machines! I have 3 cats, a dog, a 2 yr old, a husband who works construction, and another little girl due very soon! One of my cats refuses! to cover her poop. And sometimes "misses" the box when peeing. Seeing as her litter hox is in my room (we have several around the house) I am constantly woken up by the infamous kitty "bomb". And being pregnant I cannot clean it myself, let alone get to it right away! So there we are contending with this atrocious and sometimes, dare I say it, deadly smell until my husband gets home from work and school! I currently have two of these - one in my laundry room where my cats' litter box is and one in my "kitty nursery" where I keep foster kitties. Because of the risk of "escapees", I can't keep the window open more than in inch in my Kitty Nursery, so I don't get a lot of ventalation. I often have litters of 5-7 kittens and their mom - requiring several litter boxes - in a small space. The CritterZone has saved the day. Plus, there was a situation where I rescued (and eventually rehomed) 3 litters of kittens (12 total), while I still had a foster and her 4 babies in my nursery, plus one adult foster, plus my 2 cats (plus 6 outside strays/ferals). I kept the 12 strays in 4 large dog crates in my family room until the fosters were adopted and they could move to the kitty nursery. So I bought a third CritterZone for my family room (which I later gave to my dad for his inside cats). They are totally amazing! Imagine having 20 cats in your house and people come in and don't even realize you have litter boxes. I was skeptical at first, and thought they might be a little expensive, but they have been so worth the money. I would love to win one for another foster mom I know who is having issues with her stinky foster room (and as I'm sure other fosters understand, money can sometimes be tight when you spend all your money on taking care of fosters, strays, ferals, and any other kitties that need help). I have five sweet girls, all rescues. We had one, then rescued a momma and her three kittens from a neighbor's backyard. Unfortunately the majority don't like to cover up after using the litter boxes. Ugh! We could use one of these! I adopted an elderly large dog last November. Poor Loki was a litany of neglect-caused problems: skin infections, ear infections, bladder infection, fungus infections on his feet, matted coat, etc. But the absolute worst of the worst was his mouth. The infection and dental disease was beyond belief! His breath could be considered a lethal weapon! My cats would not even come into the room with him. As my Dad used to say, his breath could knock a buzzard off a dung heap. Well, 5 months ( and lots of dollars) later, all of Loki's infections are cleared up and a dental left him with exactly four teeth and fresh breath. He smells much better! However, there is a lingering miasma of dog funk not usally associated with his breed. Because he had so many teeth pulled, he drools a little all the time and dog saliva stinks! My kitties no longer avoid him (big ole 70 lb dog is afraid of 2 10 lb kitties! ), but I think the CritterZone just might be the thing to bring a little freshness back to Loki, Merlin, and Simon's lives – plus mine too! Six stinky cats who need CritterZone!! I have 6 rescue cats. I love them all dearly, but they sure can stink. My eldest is at the age where she sometimes doesn't make it to the litter box. Having 6 cats, means that when one decides to go, they all decide to go. It can leave a very bad smell in my house. That's a guarentee. I have tried everything, except the CritterZone. This seems to be the answer to my prayers. Cee Cee dropped a Poopie Bomb!!! Ever since I brought Cee Cee in from her vagabond life outdoors and got her spayed, prettied up and pampered, she has always rewarded me with her Stenchy poop. AND her misplaced Pee. Cee Cee is a Poopista Supreme -- even tough she is a tiny cat. So far I have gotten her to sucessfully use a pee pad -- but by the time I get home, if both litterboxes are filled and the pee pad has been used, everything is ripe, and spraying the air (circumspectly, so Cee Cee doesn't get blasted by it) a store-bought dollar can of scented air-spray only makes it worse. To keep from gagging, I try to stick my nose into my sweater while I clean up everything. Boy could I use a CritterZone!! Only then will I be able to stand by and say to Cee Cee -- "Poop Away, My Girl! We can BOTH handle this now!!" You could have been writing my story. Here at KKR I too foster most of our rescue cats and kittens. Love them all. Since I live in a rural are I usually don't even have to go looking for kittens or cats to rescue. My 4 closest neighbors (within a 2 mile area) have made it their mission to anonymously drop off most of the kittens that are born in their barns. We get these little waifs in every kind of condition you could imagine. The one thing they all seem to have in common (along with grossly infected eyes, worms and parasites I can't even pronounce) is the added essence of cow and horse manure. These kittens are born, raised and play in sloppy manure. So after they get a bath and are clean from nose to toes, the real fun starts. Litter box training!! Oh yeah I get to be mom because for some reason the mother cats don't seem to be beating a path to my place looking to retrieve their offspring. Who could blame them when they smell like that?? LOL There are days, too many days, where that nose-wrinkling fragrance hits you like a Mack Truck when you walk into the Cat Room. Whooo-eee! What a blessing the Critter Zone would be for my family and I. Who knows?? They might even let me save more!! Thanks Robin for the review. You are offeriing a lifeline for those of that do "the dirty work" everyday! I have 17 cats who are all indoor. Then, after my mother passed away, I inherited her two cats, who are indoor outdoor. I have a total of twenty litter box and spend my day scooping the boxes because I also have three little Pomeranian girls. They weigh less than any of the cats. The largest dog weighs just five pounds. The dogs were rescued from a puppy mill situation and never learned to ask to go out. I have to use puppy pads. Sometimes that can be a bit stinky but the real stinky guy is a male cat that had severe anxiety issues. He had been trapped in a small shed where he was alone and frightened. When I got him he didn't know how to use a litter box. I finally got him calm enough to potty in the box except he would not and does not pee in the box. He got to the point where he trusts me and he has decided that I am his. So he began spraying my clothes, my furniture, my purses, the walls, my computer, in short, everything that may even slightly smell like me. He even sprays me. He has done that twice now. So now, the other male cats have started spraying everywhere to compete with Aramis. I have one female who also sprays. In total, there are three males and one female who sprays. I live in a pretty stinky house and we go through a lot of Fabreeze. I should own stock in the various 'odor remover' companies. I have tried everything from Scoe10 to Nature's Miracle. They are expensive and take away from the resources that actually go to care for the animals but I do have to say that my friends ask me to spray my clothes before I get in their cars or go somewhere with them. It would be nice to have clean air instead of stinky. Critter Zone Take me Away! You are singing my song Robin! I too am the main foster for our rescue and I have devoted two large rooms in my home to the fosters. (Much to the dismay of my family that loves the fosters and despises the odors). Many of our kittens are anonymously and mysteriously left at my doorstep. (Who else do we know that literally gets their kittens delivered??) these are the typical baby barn kittens, complete with infections and more parasites than I can pronounce. These special little babies also come to us fully soaked in "Eau de Manure" too! It gives a whole new meaning to the question, "Were you born in a barn?". We can safely say Yes!! Even after a bath and days of litter box training (oh yeah) they still bring the smells of being down on the farm to the great indoors. After many attempts to locate the culprits (none of my neighbors will fess up so I could stop the trek) and since the mother cats don't seem to be rushing to my place desperately trying to recover their missing kits, we face a unique and added essence to the already natural odors these babies bring of their own accord. It would be a blessing to my family to have our very own Critter Zone. So, if you are re-homing one? Come on down my road and leave it on my front porch. Anonymously, of course. OMG, what happened in here?! Like many folks here, I have foster kitties. One of them, diabetic kitty Jibbit, also has what appears to be IBD or treatment-resistant diarrhea. When he and his sister Sunshine were shut up in the foster room, I could smell the stink of his liquid poop all the way DOWNSTAIRS! Going into the room was like walking into a sewage treatment plant. Now that he's free to roam the house, he's putting that stuff in every. single. litter. box. Which means I need about 5 of these CritterZones! The one in the downstairs litter box area works like a charm, even on his stink, so I know it would take care of it in the smaller areas where he leaves his mark. I am glad that there's constant air circulation around it now, since when it was trapped in the foster room, I could barely breathe whenever I went in there! Poor baby, I wish I could figure out how to help him. In the meantime, I need to be able to corral the paint-removing stench of his poo! I suspect one of the reasons Sunshine is so happy now is that she isn't trapped all day with that smell!!! I have 9 cats. Some have a more "delicate" odor than others. I have several with special needs. One has colitis, another has kidney issues and pees A LOT, one is eyeless and has horrible aim but lastly we have Peanut, The Foul. I adopted her knowing that she had special needs. She was sexually abused as a kitten, yes sexually abused! She was taken by the SPCA and put up for adoption. She has a misaligned vertebrae that is pinching her spinal cord. She has problems with Urinary and bowel movements. She leaves drips of pee and "hershey kisses" where ever she goes. We go through a lot of cleaning supplies and air freshners to help battle the Peanut stench. I love her more than anything and will follow her with clorox wipes for the rest of her life. My "stinky" problem is a little different from the others I have read. I have 2 cats who are really good about using the box (with an occasional poop accident) and are fed a good diet so their poop doesn't stink too bad (that's what they all say--"my poop doesn't stink"!). Anyway, my problem is stink bugs. I have had several at a time in my apartment for months now. They wouldn't bee too bad an issue --except that they are gross--because I can catch them and flush them pretty quickly. What the problem is that my 2 cats think that the stink bugs are their pets. They chase them around the apartment when they see them. And when the cats chase them, the stink bugs let go of their stink. I don't know if anone else has had them but the smell is terrible and it takes forever to get rid of. I have yet to fins anything that works, other than just time (uasually 3 or 4 days). So far as I know the cats haven't eaten any of the bugs but if they do, that would be a whole other "stink" I am afraid. So, there are my reasons for wanting one of these little "destinkers". I would love to win and would let you know if it works on my strange stinky issue. You're supposed to CLEAN them? LOL! I already have 1 CritterZone and it DOES work! I currently have 6 cats and 1 dog who, from time to time over the years, have peed and pooped various places throughout the house. I also used to have rabbits. Needless to say, my house has a bit of a zoo-like odor. 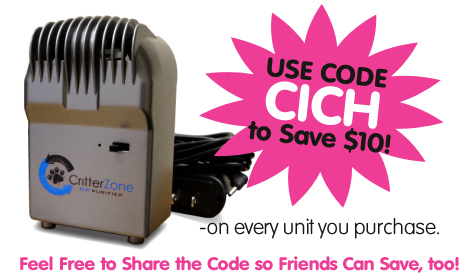 The CritterZone I already have does great but there is just too much space for 1 unit to keep smelling fresh and clean! The WORST stench I have ever smelled, animal related or not, happened several years ago. My big dog (RIP Estes) had a bit of a sensitive stomach and would vomit yellow, foamy stuff if he didn't eat for several hours. One morning my (ex-)boyfriend and I woke up to the sound of Estes puking in the bedroom and a smell I cannot even describe well enough to do it justice. Turns out Estes had eaten during the night but not dog food. He cleaned the litterbox for us! So there all over the hardwood floor was yellow, foamy dog vomit with several cat poops in it! Neither one of us could handle the smell without gagging so I had to literally hold my breath, run into the bedroom with paper towels, run out, breathe, run back in, scoop and run, repeat... I'm still traumatized!! This is something that sounds like I need... I have five cats and a husband. My cats all have stinky poops but I believe my poor husband beats the cats. So please pick me where I can live in a smell free house with all these precious ones that I love!! Thanks for the chance to win this great air purifier. I have four cats, and four litterboxes for them which I scoop twice a day. Still, they always seem to poop after I've gone to bed. I am so tired, I lay there and wonder if it's worth it to get up and scoop the poop so that the smell does not linger or stay sleeping (sometimes it is hard for me to get back to sleep after getting up)... I wish everyone could win one, it sounds like a lot of people need them, or could use them. And thank you for the review. It means a lot to know that it's safe, easy to clean, no filter, and works! Even if I don't win one, it's on my list of stuff to get someday. I had never heard of this product until you wrote of it, thank you so much. I would love to win this product. Being a mini "rescue" it is difficult to budget for a purchase like this. As soon as a few dollars are put away either the car breaks down or another fur kid who needs medical shows up. Thanks for all you do.sure hope my four inside rescues can check it out.